Make everything in your kitchen delicious, not just the food. It’s the most popular living space in the house, so why not transform an ordinary kitchen into your extraordinary comfort zone? You don’t have to go through a major renovation to change your kitchen from just a place to cook and eat to the perfect spot to gather, relax and unwind with family and friends. Even if you already have the latest appliances, sleek countertops and beautifully finished cabinets, without the right light, your kitchen will be just another utilitarian space to cook and serve meals. A few carefully chosen, well-placed light fixtures can totally transform your space into a more comfortable, functional, beautiful space. Under-cabinet or toe-kick lighting is easy to install and instantly creates an updated look. If your kitchen’s only source of lighting is from recessed cans, consider adding a few fixtures to serve as aesthetic and functional focal points in the room over the causal eating area and/or the island. 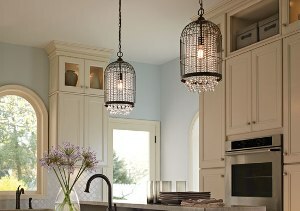 Pendants are easy to install and come in many different sizes, colors and styles. In fact, pendants are perfect for pretty much any space in your entire home. And with the many different styles and materials available in today’s fixtures, you can easily create a look that shows of your personal taste. See the newest lighting products and learn more about lighting trends at an Hortons Home Lighting showroom. No matter what type of light fixture you choose, be sure to install a dimmer. By dimming the light in your kitchen, you can control the ambience, as well as create the best environment for whatever task is at hand. Whether you are cooking, doing homework or entertaining, the light level can be adjusted to make that activity more enjoyable, not to mention easier and safer too. You can bring the light level up to its brightest for detailed tasks, and down to a pleasant, mood-enhancing level for enjoying a meal and relaxing. A professionally trained representative at Hortons Home Lighting can show you the latest dimmer switches on the market. What kinds of bulbs can be used in the recessed can lights in my kitchen? My electrician says I must only use Halogen bulbs (50 watts max), and others tell me I can use any bulbs, including LEDs. There are LED bulbs that are designed to be replacements for halogen bulbs. It is fine to use the LED replacement bulbs, because they have very low wattage. As long as you are not exceeding the 50-watt limit of your fixtures, it is fine to install LEDs. To see the best LED replacement bulbs, you should take one of your existing bulbs to a lighting professional at your local ALA-member lighting retailer.